A breakthrough microfluidic perfusion plate that enables high quality cell culture in a 3D matrix. This array contains 32 independent micro-chambers designed to be user filled with an extracellular matrix (ECM) of your choice. Cells can be overlayed or embedded in the gel for long term perfusion culture. Perform multiple 3D ECM experiments at a fraction of the time and cost of alternate methods. Also works with 2D culture and surface coating. Formatted to a standard 96 well plate with a #1.5 thickness glass bottom, enabling high quality microscopy. Our innovative microfluidic chamber designs enable continuous perfusion 3D cell culture analagous to in vivo biological systems. The 3D ECM (Matrigel, Geltrex, etc.) polymerizes in the chamber on a #1.5 thickness optical glass bottom for superior microscope imaging quality. By utilizing "passive" forces such as capillary action and gravity driven flow, we have eliminated the need for external pumps. 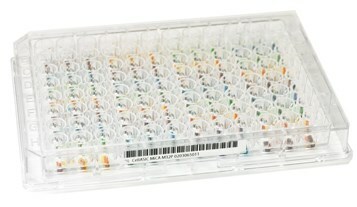 Simply pipet your solutions into the designated wells and place into a standard incubator, just like any 96 well plate. This design is automation friendly and compatible with 96-well liquid dispensers, incubators, etc. There are no threads in MilliporeSigma CellASIC® MiCA Microfluidic Cell Culture Arrays Reviews at this time.